This is the second of two wines that I'm reviewing by Valdivieso of Chile. The other day it was their Brut Rosé and today it's their be their 2015 Gran Reserva Sauvignon Blanc. Valle de Leyda is a subregion of the San Antonio Valley region of Chile. With the coast visable from the vineyards, the cooling breeze from the ocean and poor soil (offering minerality), its terroir makes it mostly a white wine producing region and is particularly regarded for Chardonnay and Sauvignon Blanc. 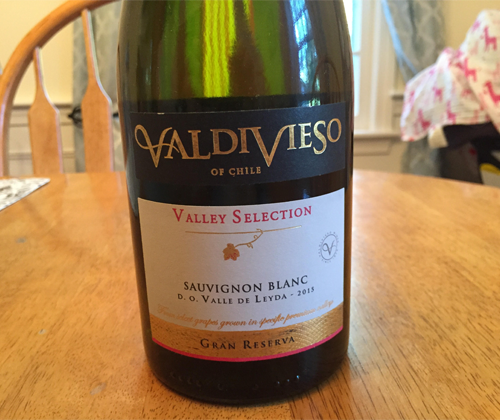 Valdivieso's Gran Reserva Sauvignon Blanc is from Valle de Leyda and is 100% SB. It was hand harvested, steel tank fermented with temperature control, saw no malolactic fermentation, and sat on some of its lees for three months. It has an ABV of 12%. Our baby dragon Miss Daisy has had quite the day and is having quite the night of breathing fire with her colic and teething and overall difficultiness, so this is going to be a quick one. The color is almost as light as water. The nose is an assault of green pepper and freshly cut chives, backed up with grapefruit, clementine, and asparagus. On the palate it's light bodied and crisp. The acidity is more laid back than I thought it would be, making it also go down a little too easy if you know what I'm saying. There's flavors of passion fruit, lemon-lime soda, and a little splash of grapefruit. It finishes with lemon-lime soda and green pepper. I really like this Sauvignon Blanc! Not only is it easily approachable, it's food versatile and good on its own. For the price, I've got to give it a recommendation!